It is every woman’s dream to have her dream wedding be fulfilled during her very special day. Last Wednesday we have just attended our friend’s wedding and indeed it was a memorable one. But before that we threw her shower party days before her wedding and we really had so much fun. Speaking of wedding, another friend of mine will be getting married next month and again we are planning to give her a shower party of course. As of this time, we are looking for bridal shower favors at galaweddingfavors dot com which offers bridal shower favors for that special wedding celebration. 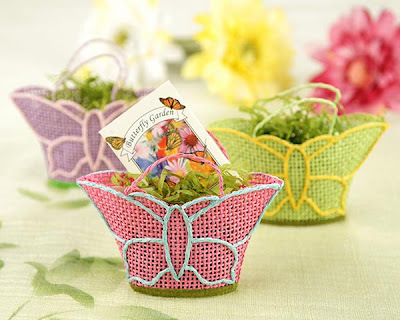 Good thing that I have found this cute butterfly gift basket that is lovingly designed to remind one’s guests of a springtime garden in bloom with a dainty butterfly frame and charming mesh lining. Isn’t it cute? i love this wedding favor, ang ganda!